Kapronasia's new report entitle "China Moving Abroad - A look at the legal...and not so legal ways Chinese nationals are moving their money abroad" is now available for download on Kapronasia.com. To view and download the report, please go to our research section here. Will VTMs disrupt the ATM industry in China? China has been going through rapid urbanization during last decades and in the past ten years alone the percentage of population residing in cities has leapt from 40.5% in 2003 to 53.75% in 2013. Private Banks and China now liberalizing - New opportunities? China is beginning to open its financial sector with the approval of three privately owned banks, extending the wave of financial reforms aimed at boosting China's changing economy. Earlier this month, the US and China held their annual talks in Beijing, where they discussed trade, economic, regional, and political concerns. Kapronasia's ATMs in China 2014 webinar and slides are now available in the webinar section of the website or by clicking here. 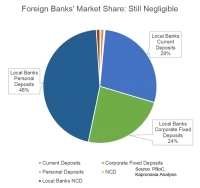 PBoC’s 2013 annual report shows that foreign banks in China showed steady growth and even outpaced GDP growth in terms of new deposits, but still lag their domestic competitiors. According to Wangdaizhijia, a resouce on the P2P industry in China, there are 148 P2P platforms in total closing, already closed or facing difficulties in redemptions. On March 1st, 2014, Shanghai FTZ has removed the cap for foreign currency deposit rates, which apply to small accounts with less than USD3 million. After the three-month pilot, the market seems to be running steadily and enterprises in the Shanghai FTZ now can ask for higher rates for their forex deposits with the banks.